Removing and replacing a rear wheel on a bicycle can be more challenging than the front wheel because of the gear cogs and the derailleur. It is necessary to remove the rear wheel when making repairs to the tire or inner tube. When replacing a rear wheel, make sure you replace it with a wheel that has the same inner diameter. 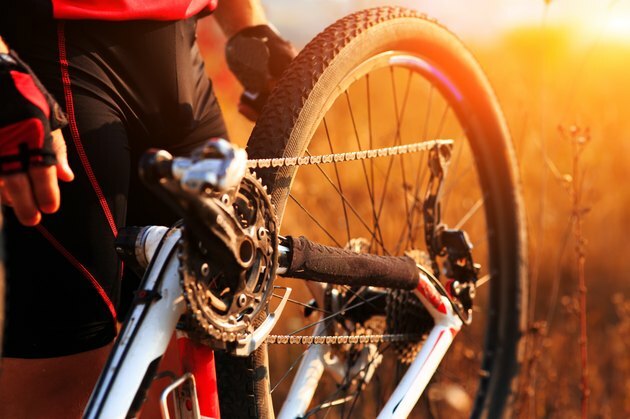 Take the bicycle wheel you removed to a bicycle shop for proper wheel replacement. Pedal the bike and shift the gears on the bicycle to the high gear. This moves the chain to the smallest gear cog on the rear wheel. Loosen the tension screw on the rear brake shoes to open the brake. Grab the derailleur with your right hand and pull it back while rotating the quick-release lever to the open position with your left. The derailleur moves the chain from one cog to the other when shifting the gears. Pull the rear wheel off the ground wall while holding the derailleur back. Push the rear wheel forward and down until it releases from the rear forks. Place the chain of the smallest gear cog on the rear wheel replacement. Hold the derailleur back with your right hand and verify that the quick release remains open. Insert the replacement rear wheel into the rear forks of the bicycle. Center the well and verify that it is secured in the dropouts at the end of the forks. Close the quick release and tighten the tension screw on the rear brake shoe. While the tire is off the frame, check the condition of the brake pads and replace them if necessary. Before riding your bicycle, double check to see that the wheel is securely locked into the frame. If it is not secure, it could come loose causing a crash.